Commemorating the historic speech of Swami Vivekananda at Chicago the Vidyalaya celebrated Universal Brotherhood Day with the students of Assam Valley Junior College and ITI, Tezpur at KatekibariBibahBhavan, Tezpur. SjtBijoySaikia, Principal, AVJ College, SjtAbhijitKalita, MD, AVJ College, SjtPranjalSaikia, MD, ITI, Tezpur and Dr. R N Pal, coordinator, VKV Tezpur were present. Students presented part of the Chicago Speech, patriotic song, Pyramid and Satriya Dance in front of the gathering. The principal of AVJ College appreciated the program and was positive that his students will surly get influenced to read more about Swami Vivekananda. 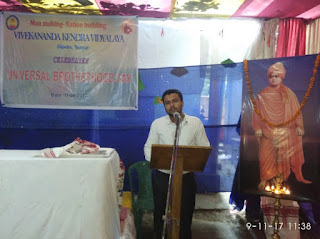 SmtSangeeta Devi, Headmistress, VKV Tezpur gave a brief yet effective welcome speech, the Significance of the day was delivered by PrzapatiNandanparashar, Computer Teacher, VKV Tezpur and DR. R N Pal conveyed information about Vivekananda Kendra to the students. The event was overall successful with around 350 students.